The following statement was issued by the Secretary General of the AIDLR, after the conversation in New York at the United Nations Headquarters between Dr. Liviu OLTEANU and H.E. 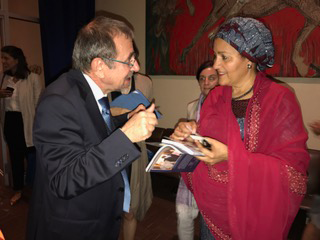 AMINA MOHAMMED, Deputy Secretary General of the United Nations in the context of the Launch by Antonio GUTERRES, United Nations Secretary General, of the Plan of Action for Religious Leaders and Actors to Prevent Incitement to Violence that Could Lead to Atrocity Crimes. Her Excellency has been invited to collaborate with the AIDLR at an international level on the defense of interreligious dialogue, respect for differences, peace and freedom of religion or belief.